It’s mid-August and lately I’ve been aware of that familiar late summer feeling when the light begins to change and a tugging happens in my heart: summer’s almost over! We’ve had an abundance of delicious fruit and vegetables this year however the early fruits a re now gone, blueberries are fading from the scene, peaches have been stars and are now beginning to wane. 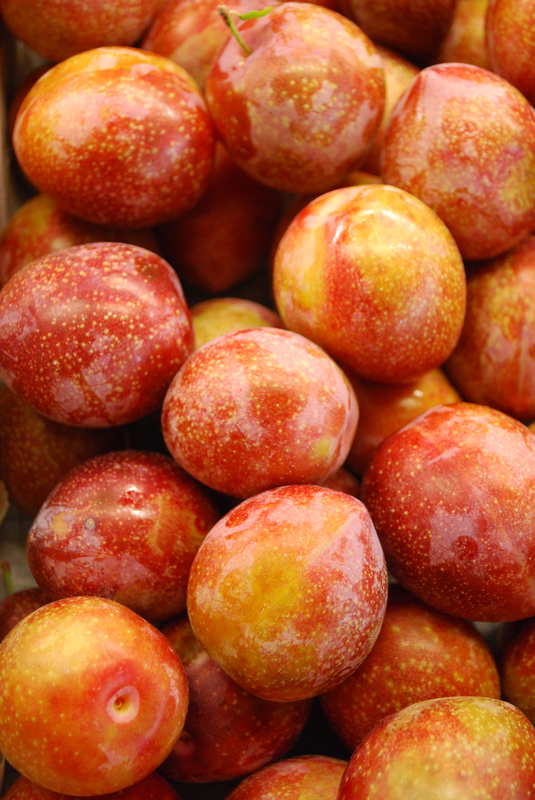 So what a treat to get our delivery from Red Jacket Farms and see and taste their stunning Vanier speckled plums. We put them in the case for all to enjoy and Melinda had a heyday making pies which just came out of the oven. 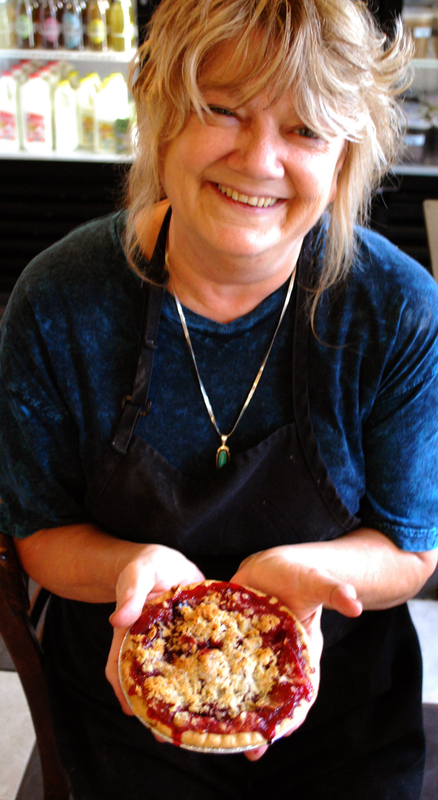 Come on in and enjoy the samples she put out of the plum filling. Absolutely divine! or buy a pie to take home. This weekend we’re creating an antipasti table for a large wedding and wanted to utilize some of the fresh, local vegetables that are available and delicious right now. After taking a look at these colorful and freshly picked peppers, there was no doubt that we had to include pepperonata in the mix! 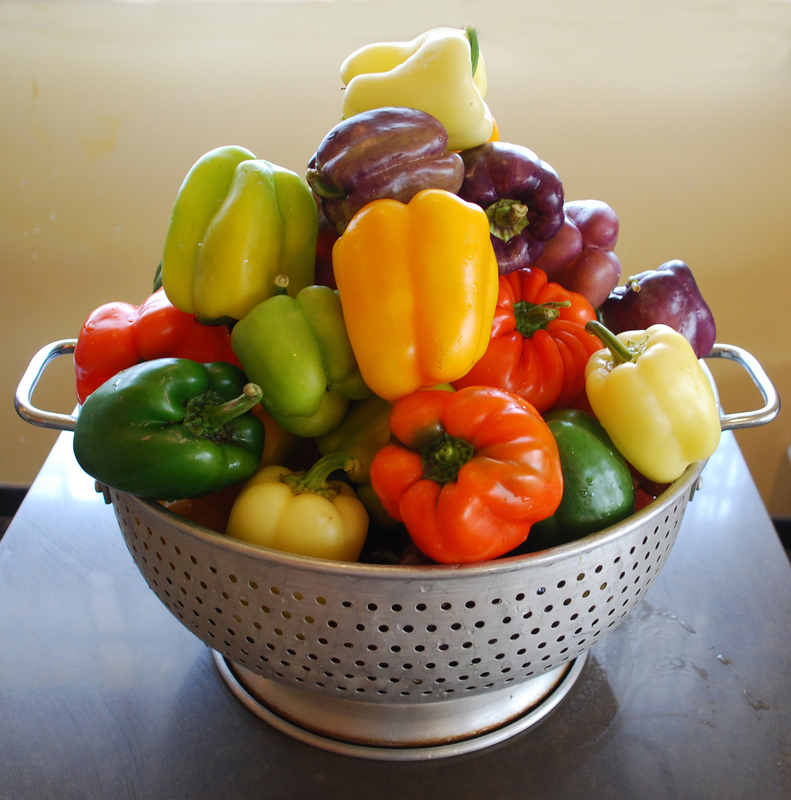 If you don’t have all these amazing colors to choose from, it works just as nicely with solid red or yellow bell peppers – always best if you can purchase them from your local farm stand this time of year. 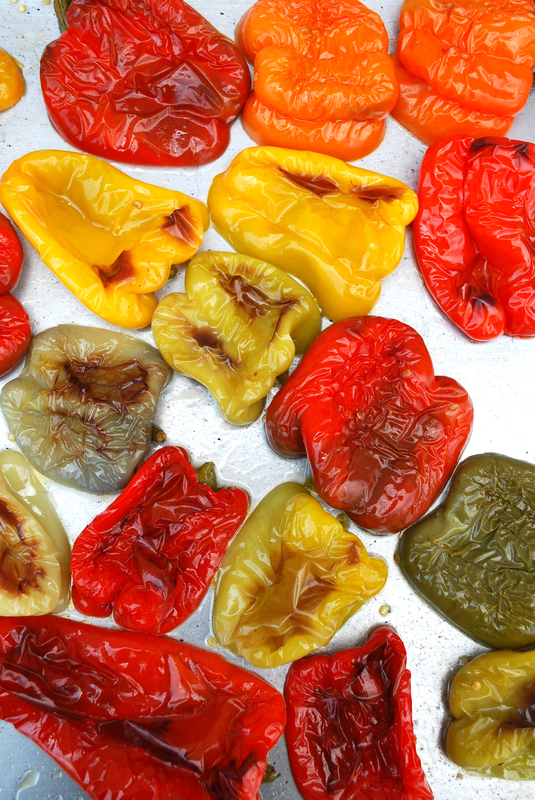 Start by cutting the peppers in half, remove the seeds and stems, lay them skin side up on a baking sheet with a little bit of water and roast in the oven at 350 degrees until you see the skins have become crinkly (approximately 20-30 minutes). We prefer to roast them in the oven instead of over a grill because the flavor stays clean and fresh – no charred taste – more of the pure taste of the peppers. Next put them in a bowl, cover with plastic wrap or a sheet pan and let them steam. When cool enough to handle, peel the skins off. Cut the peppers into strips and set aside. Thinly slice red onion, garlic and cook slowly in olive oil. When the onions are transluscent add the peppers, a few capers, green olives, season with salt and pepper and simmer for 15-20 minutes. Remove from the heat, add a splash of red wine vinegar an d a few basil leaves, check the seasoning, let cool and serve. 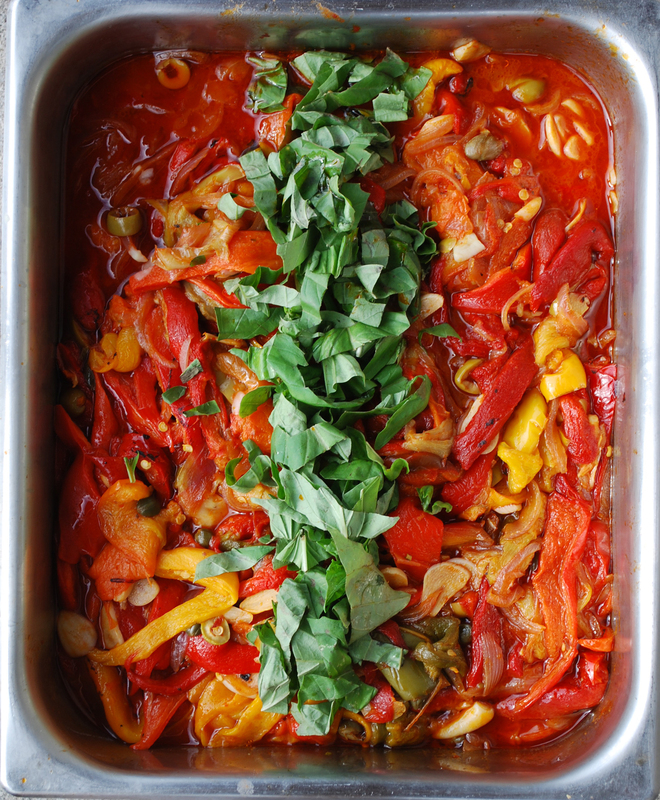 Pepperonata makes a delicious antipasti: serve with a sliced baguette or toasty bruschettas. It also makes a wonderful topping for grilled chicken or fish. Mangia! Now is the time to let your imagination soar! Summer fruits make the most delicious accompaniments to any meal. 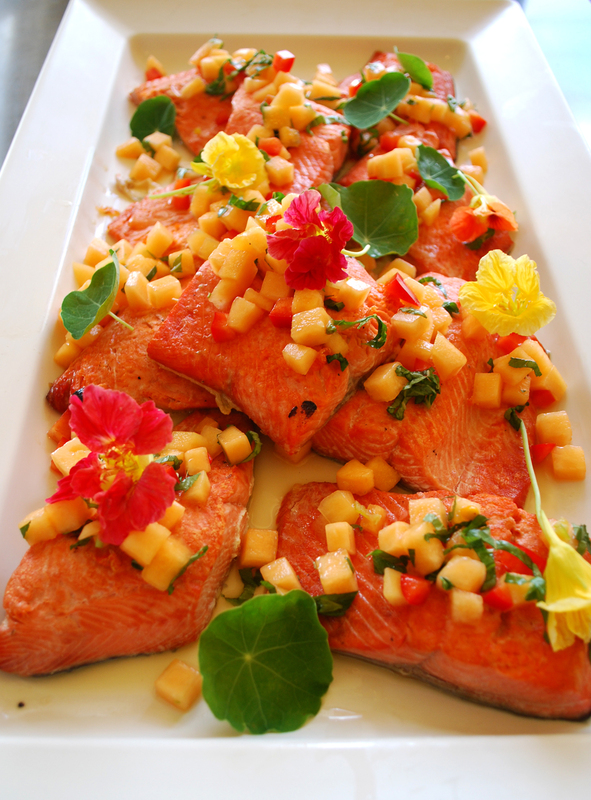 Our chef Jonathan Sheridan came up with this sweet and spicy melon salsa to garnish wild sockeye salmon from the Pacific Northwest. Take any summer melon (in this case cantaloupe) and dice into 1/2″ cubes. Combine in a bowl with some chopped fresh basil and mint. Add diced sweet red pepper, finely diced hot chile pepper, fresh squeezed lime juice, agave syrup and toss. We picked some nasturtium flowers and leaves from the garden which add more color and spice to the presentation. What a great centerpiece for your summer table! 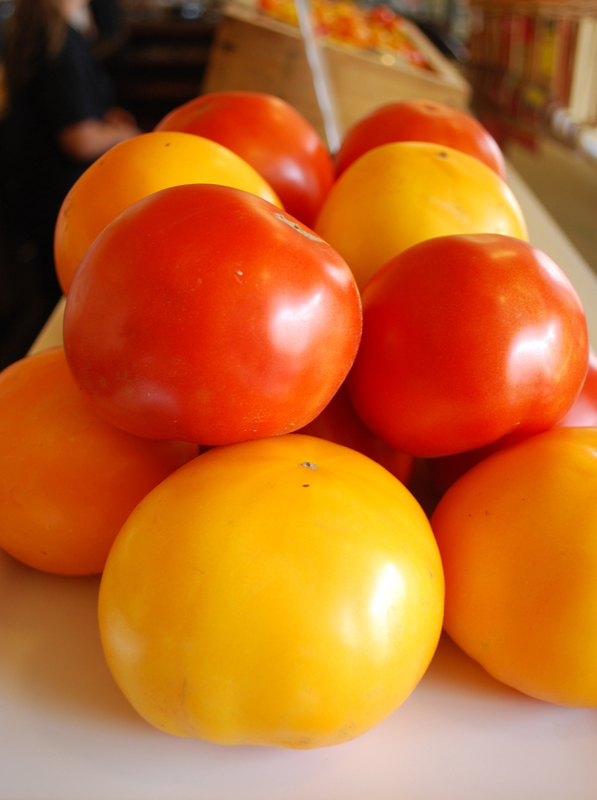 Turn these gorgeous beefsteak and low acid tomatoes (ours are from Gill Farms) into a simple summer favorite! 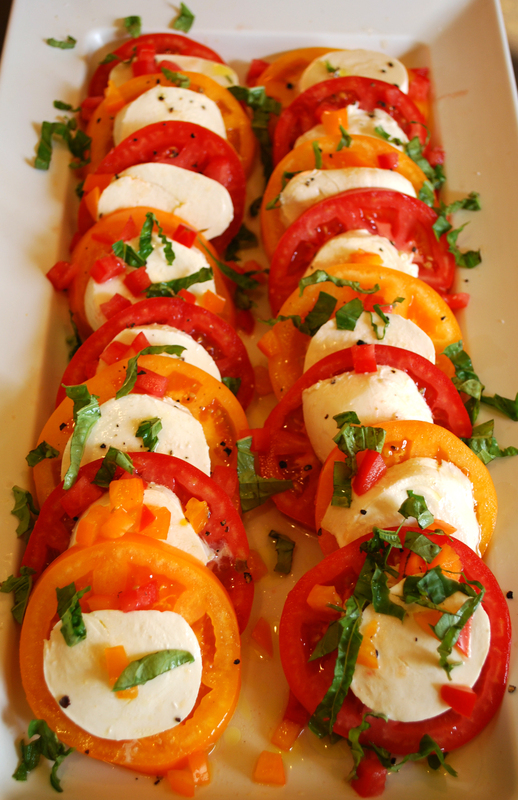 Slice the tomatoes and layer with fresh mozzarella on your favorite platter. Drizzle extra virgin olive oil, sprinkle with sea salt and cracked pepper, freshly chopped basil and a good balsamic, red wine, or sherry wine vinegar and voila!